What’s for Dinner? Pumpkin in the Soup, Entrée and Dessert! Pumpkin is my favorite fruit right after blueberries. When the leaves start to change, I know it’s time for pumpkins and my beloved pumpkin recipes. Pies, breads, puddings – I just can’t seem to get enough of this seasonal fruit. Pumpkins are a superfood, loaded with vitamins A, C, E, K, and many minerals including magnesium, potassium, zinc, and iron. Pumpkins are high in antioxidants – carotenoids, lutein, and zeaxanthin – and are an excellent source of fiber. The autumn season has allows me the opportunity to explore new pumpkin recipes. As homemaker and cook/baker when I’m home, I boast a collection of well over 200 cookbooks that I love to pour my heart and taste buds into. The following are a few of the new recipes I have already tried out this season. I hope you enjoy them as much as I do. Roasted Pumpkin Apple Soup: Preheat oven to 450°F. Toss 4 lbs. pie pumpkin (peeled, seeded and cut into 2-inch chunks), 4 large sweet-tart apples (Empire, Cameo or Braeburn unpeeled, cored and cut into eighths), 1/4 c. extra-virgin olive oil, 1 tsp. salt and 1/4 tsp. freshly ground pepper in a large bowl. Spread evenly on a large rimmed baking sheet. Roast, stirring once, for 30 min. Stir in 1 tbsp. chopped fresh sage and continue roasting until very tender and starting to brown, 15-20 min more. Transfer about one-third of the pumpkin and apples to a blender along with 2 c. reduced-sodium chicken broth or vegetable broth. Puree until smooth. Transfer to a Dutch oven and repeat for two more batches. Season with the remaining 1/4 tsp. salt and heat through over medium-low heat, stirring constantly to prevent splattering, for about 6 min. Serve each portion topped with toasted chopped hazelnuts and a drizzle of 2 tbsp. hazelnut oil. Makes 12 cups. Serves 12. Make Ahead Tip: Cover and refrigerate for up to 3 days. Reheat in the microwave on high, covered, stirring frequently, or on the stovetop over medium heat. Pumpkin Ravioli: Combine 1 c. canned or fresh pumpkin, 1/3 c. grated Parmesan cheese, 1/4 tsp. salt, and 1/8 tsp. black pepper. Spoon about 2 tsp. pumpkin mixture into center of each wonton wrapper (you will need24 wonton wrappers). Moisten edges of dough with water; bring two opposite sides together to form a triangle, pinching edges to seal. Place ravioli into a large saucepan of boiling water with 1 tsp. salt; cook 7 minutes, and drain in a colander. Place 1/2 c. chicken broth in pan; bring to a boil. Add ravioli, tossing to coat. Sprinkle with chopped parsley. Makes 24. Serves 6. Pumpkin Cookies: Preheat oven to 375°F. Beat 1/2 c. corn oil and 2 eggs until well emulsified. Add sugar substitute to equal 1 c. sugar and beat until fluffy. Add 1 c. pumpkin, then the following dry ingredients: 2 c. flour, 1 tsp. salt, 1 tsp. nutmeg, 2 1/2 tsp. cinnamon, 1/2 tsp. ginger and 1 tsp. baking soda. Add 1 c. raisins and 1 c. walnuts. Drop by teaspoonfuls onto greased cookie sheet. Bake for 15-20 minutes. Makes 3 dozen. Serve with frozen vanilla yogurt sprinkled with pumpkin spice. In Part I of “The Perks of Pumpkin,” I discussed some of the great health benefits of pumpkin. 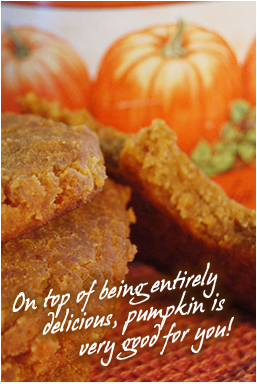 In Part 2, I am some great ways to incorporate pumpkin into your daily diet. What is especially nice about this orange-colored vegetable is that it is great tasting and extremely low in fat and calories. That makes it a delight to cook and back with. You can easily add a few scoops of pumpkin to chili, macaroni and cheese, and even spaghetti sauce. The following are just a few of my favorite pumpkin recipes to get more pumpkin in your diet. Pumpkin Oatmeal: Mix together 1 c. quick-cooking rolled oats and 3/4 c. milk (or as needed) in a microwave-safe bowl. Cook on high for 1 to 2 min., stirring once. Add more milk or oats to achieve desired consistency and cook for another 30 sec. Stir in 1/2 c. canned pumpkin puree, 1/4 tsp. pumpkin pie spice, and 1 tsp. cinnamon sugar. Heat through, and serve. Pumpkin Scones: Preheat oven to 375 degrees F. Lightly grease 2 baking sheets. In a large bowl, stir together 2 c. all-purpose flour, 2 c. whole wheat flour, 4 tsp. baking powder, and 1 1/4 tsp. baking soda. Mix in 1/2 tsp. ground ginger, 1/2 tsp. allspice, 3 tsp. ground cinnamon, 1/4 tsp. ground cloves, and 1 tsp. salt. Set aside. In a separate large bowl, cream 1/4 c. butter (softened) until fluffy. Mix in 1/2 c. applesauce, then slowly stir in 2 1/4 c. sugar until well blended. 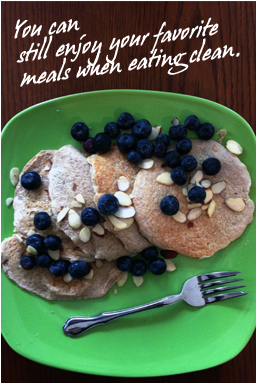 Mix in 2 eggs (beaten) and 1 (15 oz.) can pumpkin. Gradually mix dry ingredients into wet ingredients. Stir in 1 c. finely chopped pecan and 2 c. golden raisins. Drop by heaping tablespoonfuls onto cookie sheets, leaving 2 inches between scones. Flatten scones with back of the spoon. In a small bowl, stir together 3 tbsp. of sugar and 2 tsp. ground cinnamon, and sprinkle on top of scones. Bake in preheated oven until golden brown, about 12 to 14 min. Remove, and let cool on cookie sheets 5 min. before removing to wire racks to cool. Pumpkin Chili: Heat 1 tbsp. vegetable oil in a large skillet over medium heat, and sauté 1 c. chopped onion, 1/2 c. chopped green bell pepper, 1/2 c. chopped yellow bell pepper, and 1 clove garlic (minced) until tender. Stir in 1 lb. ground turkey and cook until evenly brown. Drain. Mix in 1 (14.5 oz.) can diced tomatoes and 2 c. pumpkin puree. Season with 1 1/2 tbsp. chili powder, 1/2 tsp. ground black pepper, and 1 dash salt. Reduce heat to low, cover, and simmer 20 min. Serve topped with 1/2 c. shredded Cheddar cheese and 1/2 c. sour cream. Pumpkin Protein Cookies: Preheat oven to 350 degrees F. In a large bowl, whisk together 3/4 c. SPLENDA® Granular, 1 c. rolled oats, 1 c. whole wheat flour, 1/2 c. soy flour, 1 3/4 tsp. baking soda, 1/2 tsp. baking powder, 1/2 tsp. salt, 2 tsp. ground cinnamon, and 1 tsp. ground nutmeg. Stir in 1/2 c. pumpkin puree, 1 tbsp. canola oil, 2 tsp. water, 2 egg whites, and 1 tsp. molasses. Stir in 1 tbsp. flax seeds (optional), if desired. Roll into 14 large balls and flatten on a baking sheet. Bake for 5 min. in preheated oven. DO NOT OVERBAKE: the cookies will come out really dry if overbaked. Quick Tip: In general, pumpkins can keep for a long time in a cool dry place, ideally 50 to 60 degrees. Once cut, they will need to be used within a couple of days, or freeze it, as it can mold quickly. If cooked, it’s fine in the refrigerator four to five days. One of my favorite holidays is Halloween. I love using my imagination and coming up with a new costume to wear every year. I love the spooky decorations, scary haunted houses, and festive corn mazes. I love the timeliness with autumn fare of pies, jams, breads, and dipped apples. What I especially love is it’s the also season of pumpkins. Large ones, small ones, funny shaped ones, they are all good in my eyes as pumpkin is one of my favorite fruits. Pumpkins are a superfood, packed with healthy goodness! Not only are they loaded with vitamins A, C, E, and K, they are packed with minerals including magnesium, potassium, zinc, and iron. Pumpkins are also high in antioxidants – carotenoids, lutein, and zeaxanthin. Pumpkin is also an excellent source of fiber. Just one-half cup serving contains five grams. Diets rich in fiber may prevent cancer and heart disease and help to reduce bad cholesterol levels, control blood sugar levels, promote healthy digestion, and play a role in weight loss. The vitamin C found in pumpkins boosts immunity, reduces the risk of high blood pressure and heart disease, and regulates cholesterol levels. Pumpkin is also a good source of vitamin E which promotes healthy skin by protecting the body from sun damage and may reduce the risk of Alzheimer’s disease and certain cancers. Externally, pumpkin is excellent for treating burns, insect bites, inflammations, and abscesses. It’s used to soothe irritated skin and also reverses skin damage caused by the sun. 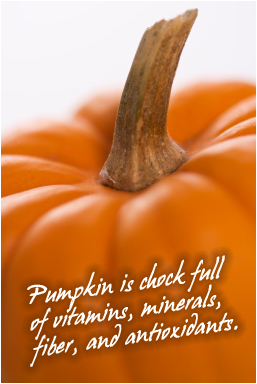 Pumpkin softens the skin and makes it glow plus diminishes the inflammatory processes of mucous. A number of hydrating and anti-wrinkle creams actually contain pumpkin as an ingredient. The seeds in pumpkins also contain essential vitamins and minerals. Also called pepitas, they are a good source of vitamin E, iron, magnesium, potassium, zinc, and are an excellent plant-based source of omega-6 and omega-3 fatty acids, fats that are heart and brain healthy. They are very high in protein (one ounce of seeds provides about seven grams of protein) and are a good source of fiber (one cup of the seeds has six grams of fiber). Pumpkin seeds additionally contain the strongest therapeutic effects, helping to eliminate intestinal parasites, clean blood vessels, adjust cholesterol levels, and stimulate kidney activity. These seeds have an anti-inflammatory effect and an energizing role in treating cancer, leukemia, osteoporosis, sclerosis, or various diseases role. Pumpkin seed oil is high in essential fatty acids (EFAs) which help to reduce cholesterol levels in the blood. The oil also contains vitamin A, which helps keep eyes healthy and stimulates the T cells of the immune system to help fight off infection. Additionally, the oil has vitamin E, which acts like lutein and zeaxanthin to scavenge free radicals in the lens of the eye. Check back for the next blog when I share some great recipes using pumpkin!